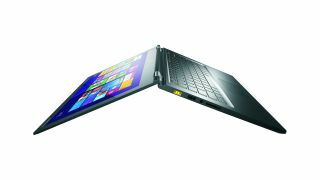 Lenovo arguably brought legitimacy to the hybrid laptop form factor with the Yoga series of IdeaPads. Now that the Chinese company has struck lightning, 2014 is a matter of refining the winning design of its flagship casual notebook. Lenovo has updated its IdeaPad Yoga 11 and 13, dropping the "IdeaPad" name and simply naming them both the Yoga 2. Nothing mind blowing here, but the 11-inch Yoga 2 now comes packing Intel's latest quad-core Pentium processor (running up to genuine Windows 8.1 this time), up to 4GB of RAM and a hard drive as spacious as 500GB behind an 11.6-inch, 1366 x 768 IPS touch panel. All this, plus a (albeit 1MP) 720p webcam, and this Yoga 2 comes in at 2.9 pounds and 0.67 inches thin–that's just one tenth of a pound heavier and less than a tenth of an inch thicker than the previous generation. That doesn't sound all that great until you hear that the 11-inch Yoga 2 will ask for just $529 (about £322, AU$589)when it lands in US Best Buy stores late January. As for the 13-inch Yoga 2, Lenovo kept things simple as well, making the jump to 4th generation Intel chips (up to Core i5), 1920 x 1080 resolution displays and upping the max storage capacity to 500GB. Oh, and a backlit keyboard now comes standard. It's the creature comforts that Lenovo hopes will keep its Yoga line fresh. Hot on the heels of its first 8-inch Windows 8.1 tablet, the confusingly-named Miix 2, Lenovo has redefined its detachable hybrid machine, the IdeaPad Miix 10. The Miix 2–the hybrid laptop, not the tablet–comes in the standard 10-inch model and a new 11-inch option in a brand spanking new design. Both models come with an interesting, rigid keyboard dock that allows the tablet to sit in either standard laptop mode or Lenovo's signature Stand mode. The dock has a speaker bar on the back of its hinge, so to speak, for enhanced audio while in Stand mode. The 10-inch Miix 2 will be available this March for starting at $499 (about £303, AU$555), while the 11-incher will go on sale this April starting at $699 (around £425, AU$778) in the US We'll see what this means for Lenovo's fresh Windows 8.1 hybrid laptop when we get our hands on these bad boys during CES 2014. Updated they may be, but Lenovo has made an interesting decision regarding its Flex line of hybrid laptops, adopting AMD Kabini APUs. Both the Lenovo Flex 14D and Flex 15D will sport up to quad-core, A6-5200M chips with AMD Radeon HD8570 graphics with 1GB of video memory. In fact, aside from screen size, not much is different between either laptop, with both accepting up to 8GB of DDR3 RAM, up to a 500GB SSHD or 1TB HDD. Both Flex models offer 1366 x 768 resolution touch displays. What's weirder is that both hybrids start at $499 (about £303, AU$555) when they land in stores shortly.